Itslearning translates the IMS ES institutionRoleTypes to itslearning profiles according to a mapping table, and only a few profiles exist by default. Edit the desired profile and complete the field "Synchronisation – Map from profile"
The value you put in this field can be used as the institutionRoleType in your IMS ES requests, so the default mapping table does not restrict you in any way. If the IMS ES institutionRoletype cannot be mapped to any of the itslearning profles, the 'Default profile for external enrolment' is used. 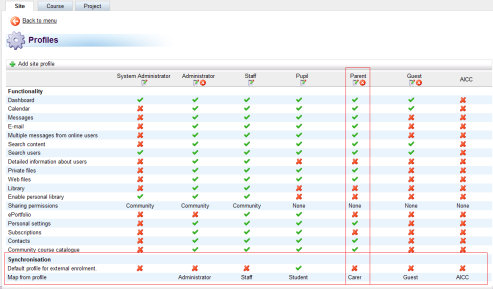 If the IMS ES institutionRoletype is mapped to an itslearning profile that has been marked as deleted (you will not see the profile in the UI), the 'Default profile for external enrolment' is used. If for the ‘Default profile for external enrolment’ an invalid IMS ES institutionRoletype is specified, ‘Student’ will be used. If the IMS ES institutionRoletype element is empty, itslearning will revert to the default profile set within itslearning, usually "Student". If you are updating a person, do not send empty tags. You should send the person's correct institutionRoleType, or leave out the element altogether. Your school will start to use the parent portal feature in itslearning, and you are going to import all the parents' user accounts through IMS ES. In IMS ES, use the IMS ES institutionRoleType = 'Carer' in the createPerson request. In itslearning, ensure that the profile you are using for parents in itslearning matches the IMS ES institutionRoleType by setting 'Map from profile' = 'Carer'.